Wiley Blount Rutledge, 1894-1949. Associate Justice, United States Supreme Court, 1943-1949. Superb Autographed Letter Signed, Wiley, three pages, 5¾" x 9", on stationery of the Supreme Court of the United States, Chambers of Justice Wiley Rutledge, dated at Ogunquit, Maine, August 1, 1949.
Letters of this kind rarely reach the autograph market. Here, Justice Rutledge congratulates then-Attorney General Tom C. Clark on his appointment as an Associate Justice of the Supreme Court. 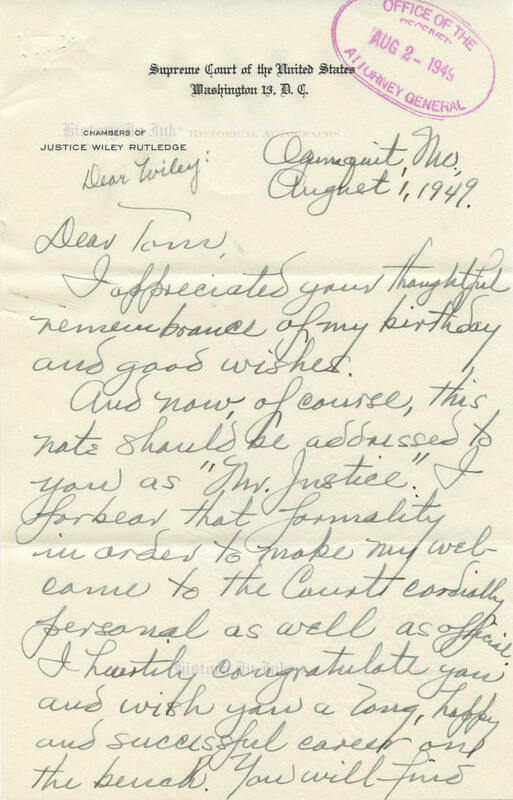 Writing to “Dear Tom,” Rutledge says, in full: “I appreciated your thoughtful remembrance of my birthday and good wishes. / And now, of course, this note should be addressed to you as ʻMr. Justice.' I forbear that formality in order to make my welcome to the Court cordially personal as well as official. I heartily congratulate you and wish you a long, happy and successful career on the bench. You will find the work hard & confining, if my experience is any guage [sic]. But there are compensations and one of them is the Courtʼs associations. / In addition to extending welcome, I want also to tender any assistance I can give, & perhaps the first bit will be to tell you to [sic] that for one coming into the circle the mental hazard beforehand is very much greater than there is any reason for its being. You have a sound grounding with long & varied experience in the law. There will be hard & tense moments. But you will not be long in discovering that it is just in these that this grounding & experience will be your mainstay, & therefore the rest of us will have no advantage of you except such as two or three weeks around the table will dissipate. / Please therefore call upon me freely at any time you think my advice or other help may be useful. And I'm sure the members of my staff will be more than glad to give any aid they can to the members of your own. / I look forward with great pleasure to working with you as a colleague. Annabel joins with me in welcome & best wishes to yourself & Mrs. Clark." Rutledge was prompt to congratulate Clark. President Harry S. Truman surprised reporters at his press conference on July 28, 1949, when he responded to a reporter's question whether he had "arrived near a point where you will nominate a Supreme Court Associate Justice" by saying, “Yes, and I can tell you who it is, if you want to know." He then announced that he intended to nominate Clark, who, he said, was “very much surprised." In fact, he said, Clark was “so surprised at being called upon" that he “couldn't give me an answer." So, Truman awaited the “go-forward sign" from Clark and from Senator J. Howard McGrath, whom Truman intended to appoint to fill Clarkʼs vacancy as Attorney General, before sending their nominations to the Senate. Truman formally nominated Clark on August 2, and the Senate confirmed him as an Associate Justice on August 18. Sadly, Rutledge did not live to serve with Clark when the Supreme Court convened on the first Monday in October for its October 1949 term. Rutledge suffered a stroke at the wheel of his car on August 27 while he was vacationing in Maine, from where he wrote this letter. He died two weeks later, on September 10, 1949. This letter is very nice. Justice Rutledge has penned and signed it in gray fountain pen. The purple oval receipt stamp of the Office of the Attorney General in the blank upper right margin of the first page touches three letters of the engraved Supreme Court letterhead. The letter also has two normal horizontal mailing folds, staple holes in the blank area at the upper left, a paper clip impression affecting all three pages in degrees at the left margin, and light paperclip stains affecting the fronts of the first two pages. A note in another hand, “Dear Wiley:,” likely in the hand of the secretary who typed Clarkʼs response, appears above the salutation. Overall the letter is in fine condition. Provenance: This letter comes from the personal collection of Justice Tom C. Clark, who served on the Supreme Court from 1949 until 1967. Justice Clark collected the autographs of other Supreme Court Justices dating back into the 19th Century. We are privileged to offer a number of items from the collection. This one comes with the backing page, which bears the federal eagle watermark and Justice Rutledgeʼs typed name, that Justice Clark inserted behind the item in the page protector used to house this letter his collection. This letter is not laid down to the backing sheet.